Names have always retained a special power, ever since ancient times when members of noble houses would vie with those of other clans to accomplish valiant deeds to win honor for their families. This trope is so prominent that it is a staple of works of fantasy, such as Lord of the Rings or Game of Thrones. One thing that distinguishes one clan from the rest is its crest, meant to convey a sense power and esteem. The design and symbolism used are not just meant to serve as stand-ins for a name or to please the eye, but they stand as imposing sigils of a proud family legacy. Sigil is used to refer to a coat of arms or an identifying sign generally, or an occult symbol in mysticism. A sigil could be used by a royal family on a stamp in order to make documents official. Its historic use in this way has made it a symbolic instrument of authority. Often sigils would consist of a figure of something which would represent the family it belonged to. Sometimes these sigils were accompanied with inscriptions, e.g. a motto. Alternatively, when sigil is being used for occult symbology, it describes a movement in occultism proper or one of its magical practices. These symbols could often be deconstructed to reveal a set of simpler ones, each representing a certain aspect or practice of the larger movement. This lends a multifaceted meaning to the symbolism for different occult disciplines. Example: The sigil of the king was imprinted onto the red wax to leave a seal on the envelope. Example: The pages of the book of spells were filled with arcane sigils, guarding its secrets. The origin of the word lies in Latin's "sigilla" which meant "seal," "little images" and "statuettes." This Latin was a diminutive of "signum" which simply meant "sign." This was appropriated by 15th century Late Latin in the word "sigillum," which similarly translated to "sign," "seal" or "mark." To describe more magical implications, Hebrew's "segula" meant a spiritual action or word, or a talisman. Sigil takes on its modern significance from both these linguistic traditions, each of which borrowed from one another. Sigillate: This derived term is an adjective used only in specific contexts, and not in conjunction with symbols generally, as sigil is. When describing pottery or ceramics, it means that the surface of the piece is adorned with symbols or crests pressed into it. In the context of botany, it takes on the more technical usage of denoting the presence of a mark resembling a crest on the plant's foliage. Example: The aristocratic family had sigillate vases made bearing their seal to adorn with flowers and place around their spacious house. Example: The scientists found the newly discovered plant fascinating for the sigillate marks tessellating on its leaves. Sigillated: This adjective describes an object, usually a piece of pottery, that bears the impressions of symbols for its design. Example: The reproduction pot bore a sigillated pattern to resemble the craftsmanship of the ancient Greeks. Sigillation: This noun refers either to the specific act of imprinting or affixing a seal to something, or to the actual physical mark left by that seal. Example: As the nobleman was in a hurry to attend to further business, he made a hasty sigillation with his ring and left. Example: The sigillation on her framed diploma showed the prestige of her alma mater. She was attempting to deploy enchantments of her own - the fiancé, the ordinary hobbies and the sensible office job were so many sigils to ward off chaos. It was not an ineffective magic. It worked. In this passage, Cho illustrates how her protagonist is so superstitiously concerned with maintaining a normal life that her embrace of mundane pursuits, like an average job and a stable long-term relationship, takes on the quality of magic words or signs - i.e. they were sigils of normality. I'd known him for a long time, since the end of the war, and I knew he used women as counters in a game, Bobby Quine versus fortune, versus time and the night of cities. And Rikki had turned up just when he needed something to get him going, something to aim for. So he'd set her up as a symbol for everything he wanted and couldn't have, everything he'd had and couldn't keep. I knew what he did to them. He turned them into emblems, sigils on the map of his hustler' s life, navigation beacons he could follow through a sea of bars and neon. To show Bobby's lack of regard for the women he romances, Gibson's narrator characterizes Bobby's view of them as merely symbolic objects, or sigils. Your symbolic sigil keeps vigil over your good name. 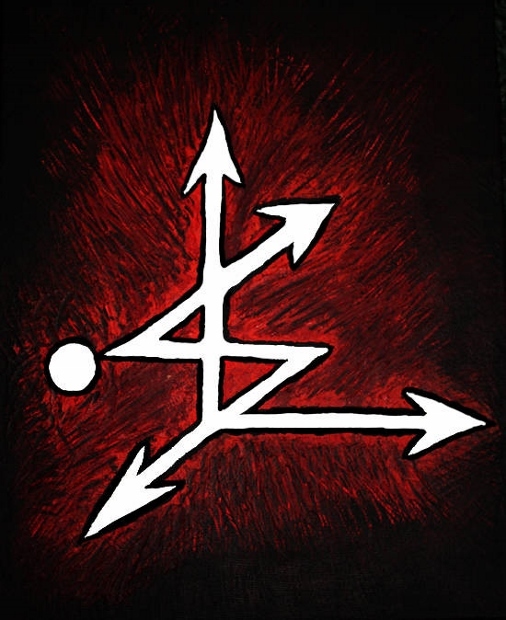 A sigil is a sign of supernatural realms. Bring out the linguist in you! What is your own interpretation of sigil. Did you use sigil in a game? Provide an example sentence or a literary quote.